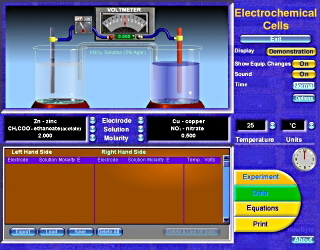 The software includes integrated on-screen introductory and advanced experiments. A simple but powerful design enables you to create your own custom experiments with thousands of electrochemical cell variations. 100 unknown electrodes are available for student analysis. Cell diagrams and experimental data may be exported or printed out. 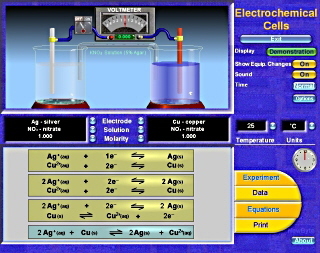 The teacher can select the details that are displayed on screen including half-cell and overall chemical equations, electron flow voltage, anion and cation movement, electrode deposits. 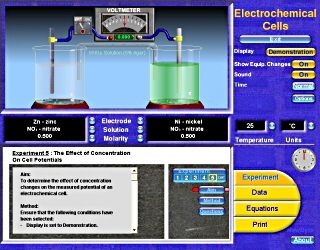 Experiments are included in both PDF and Word format for teacher personalisation.